Just a quickie before the weekend. I am still here (and mostly sane) have a few war wounds - mostly glue in my hair and ringing ears from all the pop music. The house is a tip but kids are happy, so who cares?! 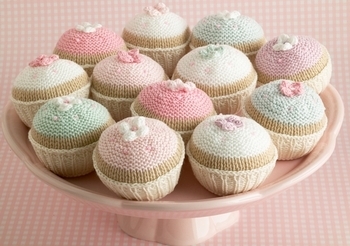 Have been a knitting nomad all week and finished off some cakes on a pastel theme. 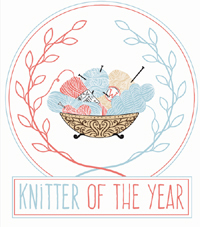 Counting down to Monday and visualising an empty house, Ludovico tinkling the ivories and my box of yarn - ahhh bliss! In truth I think the hoover will be calling and I will no longer be able to ignore the washing mountain, still I can dream. Have a great weekend everyone. Have just managed to bribe Amy off the computer with a snack, so I don't have long! 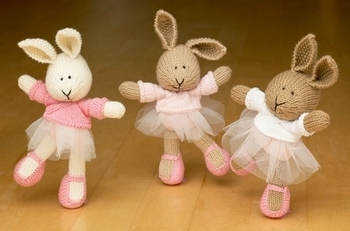 Have at last finished 3 ballerina bunnies for Amy and her friends. Am deep in the wilderness of half term (so far sanity is intact) but lack of knitting time is making hands shake and eye twitch. Have 5 days left and am determind to make it without crumbling. The camp guards here are merciless forcing repeat episodes of Charlie and Lola, hours of disco dancing to pop junior and sudden demands for food perfectly timed to create distraction. Have already put phone in fridge and juice on cornflakes. 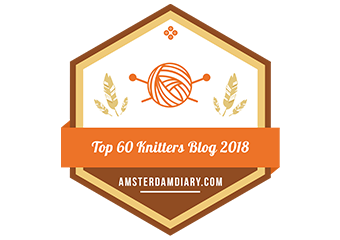 Must stay focused, must be strong, knitting days will come again. WAIT, oh no I can hear that cry "Mumeeeee..." must hide. Will contact again when it's safe. 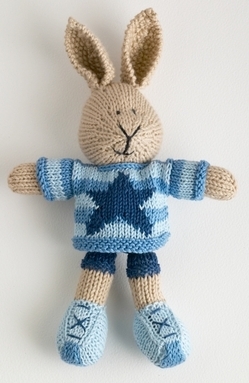 Bunny Knitter Out. Spinning and a polar bear. 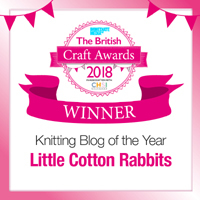 This week I have been mostly knitting rabbits. Been catching up with orders and still finishing off those ballerinas. Because each rabbit takes at least 2 days to make it's difficult for me to take on many orders but it is something I like doing because it encourages new ideas. 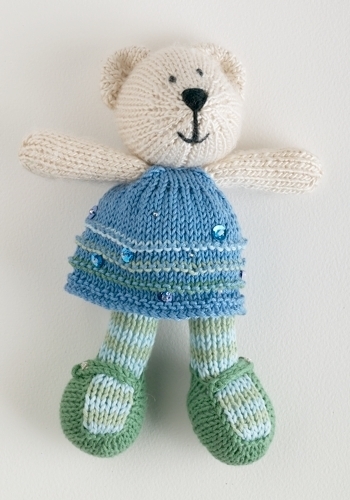 I really enjoyed making this little bear. 'Pearl the polar bear' was a commission for a lovely Lady called Jacqueline (who by the way has the loveliest shop - if you like anything to do with tea & coffee then check it out). She just said a bear, sea-colours and left the rest to me (my favourite kind of brief!) I'd just bought some beautiful pure silk yarn (Debbie Bliss) it's gorgeously soft and sheeny and seemed perfect for the job. I think I'll try and make a few rabbits in the same yarn with sequinned dresses - a kind of 'Princess' range. I'm busy trying to prepare for half-term next week. I have a good stock of colouring books for Amy - she loves Rosie Flo books (the bodies are drawn in and you just add heads, arms and legs) and we've got some new blocks on order for Toby. His absolute favourite toy is a stacking pyramid but it's getting a bit battered. He 'liberated' it from nursery last July and since then it's gone everywhere with him - he even cuddles it in bed (I know it's the most peculiar cuddly toy ever!). Huw has finished Toby's birthday present from us and installed it. 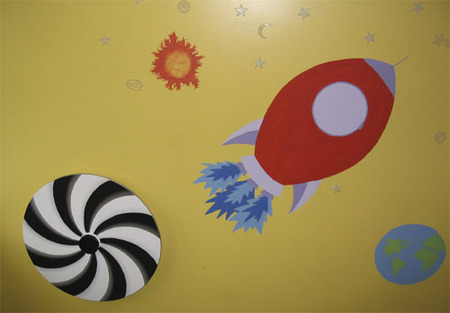 It's a big wooden spinning disc ('scuse my unfinished mural!). Toby is particulary stimulated by fast movement. Most autistic children have an area of hightened sensory stimulation - can be auditory, visual, tactile etc... Toby is definitely most stimulated by the visual. He's always been excited by watching the wheels of cars go by, watching motorbiking on the telly (takes after Daddy there!) and he loves spinning things, ball runs etc. He adores this disc and gets very close to it squealing with delight as it spins. Personally I get very dizzy when I look at it - it's definitely not one to play with after a bottle of wine! One of the nice things about taking special orders is that I get to create things that I wouldn't otherwise of thought of. For this order I was asked to knit up a girl and a boy both with shoes. It took a little working out but I finally managed a little pair of trainers and thought that he also needed some shorts. I'm really pleased with the result, so thanks Teresa for your inspiring brief. At the moment I'm finishing off some ballerinas and a few more special orders but I'll be making some more boys with shoes for the shop in the near future. Thanks so much everyone for your very touching comments. As it turns out we had a pretty good day. Toby really enjoyed his cake and his absolute favourite presents are a wooden marble run and a disco ball. Amy is coveting the disco ball but is content to share it and of course we had to have a disco which turned into 2 hours of dancing to her pop junior cd with the lights off and the disco ball going. She even made signs for the door: Closd for Privat Party and insisted I made fruit cocktails (orange juice with a slice of lemon, icecube and twizzle stick). 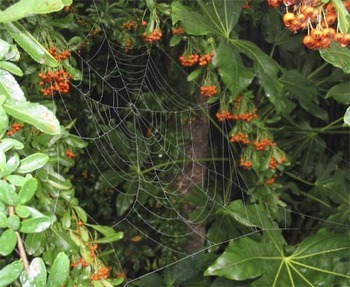 When we woke up this morning it was one of those perfect autumn mornings that I love so much - all misty and still with dew dripping off everything. It is the small things that give pleasure, dancing with children, indulging their fantasies and the beauty of nature. Thanks again for thinking of us x. Today is Toby's birthday. 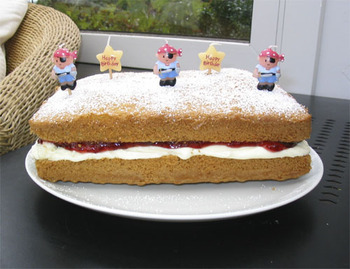 Normally children's birthdays are a busy affair; a party, lots of presents, friends and lots of excitement on the part of the birthday boy or girl. Not so with Toby. Toby's birthdays come and go without him being any the wiser. He gets to eat more cake than usual (something he definitely appreciates), he gets some new stuff and he does quite like balloons but other than that he's completely unaware of the significance. I on the other hand find this day one of the most significant in my year. It's probably the hardest day for me and one I never manage to journey without tears. It's impossible for me to get through this day without reflecting on what might have been had he not been autistic, what it would be like to have a normal family life and to be able to do normal family things all together. I mourn for his lost future - you never realise how much you take your children's future for granted (that they will grow, find a life-partner, have kids of their own and live mostly happy, fulfilling lives) until it's gone. Toby does have a future but it's a world away from what I would wish for him. It's uncertain and dependant upon others. I hope to always be around to care for Toby but I'm mindful of the fact that I may not be here to look after him for as long as he needs me. His birthday is also a marker, a measure if you like of his progess and development. Autistic children have characteristically spikey developmental profiles. 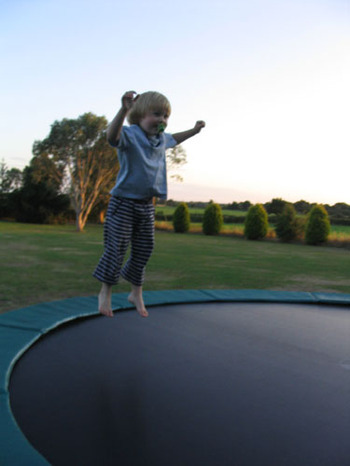 Which means that whilst he has the physical abilities of any child his age, in some areas such as speech, play and social interaction he still scores at a 12-18 month old level. Only time will tell wether he will ever develop speech. He is making progress with communication using a picture exchange method (more of that another day) and so there is a hope that his speech development is just grossly delayed. I carry my sadness deep inside and most of the year I genuinely feel mostly cheerful. I feel very lucky to be able to appreciate beauty and joy in small things such as the changing seasons, a beautiful sky, the song of a blackbird, Amy's laughter and Toby's hugs. This is the one day a year when it spills over and I let it. You need one day a year of self-indulgent melancholy - it's not good for the soul to bottle up any strong emotion. So forgive me my wallowing and please don't be put off visiting here again. I don't usually talk about how I feel like this but somehow it seems easier and a bit theraputic to write it down, a bit like making a paper boat and launching your troubles down a river on it - or maybe it's because the delete key is only a click away and so I can erase all this if I chicken out!